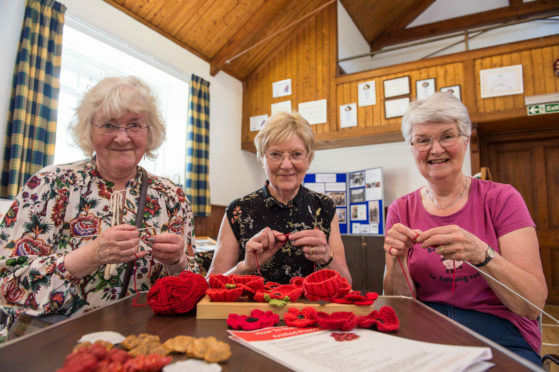 Residents in Tomintoul and Glenlivet have set the target of crafting 1,918 poppies for a display to mark 100 years since the end of World War I. At the weekend, an event to showcase relics from the conflict was staged in the area to encourage people to contribute. A decommissioned Lee-Enfield rifle, which was commonly used during the war, was loaned from the Highlanders Museum at Fort George for the Glenlivet display. There was also a trench periscope, which was deployed to peer safely over the parapet, and helmets and uniforms were also dusted off to be displayed alongside artwork from local primary school pupils. About 60 poppies were made out of paper, wool, clay and fabric on Saturday – meaning organisers already have more than 300 for November’s display. The Tomintoul and Glenlivet History Group is aiming to organise further opportunities in the run-up to the centenary to allow people to contribute. Member Jennifer Stewart explained the weekend event had parallels with how locals recovered from war wounds. She said: “Soldiers who were injured were sent back to recover at a hospital that was established at Aberlour Orphanage. “While they were there, they were taught traditional skills such as embroidery and knitting, which were intended to improve their concentration.